A refreshing flavor enhancement to regular water! 1 medium cucumber, washed and cut into 1/8-inch slices. Discard the ends. 3 slices lemon, washed and cut into 1/8-inch slices. Use more depending on taste preference. Place cucumber and lemon slices in a gallon sized pitcher; cover with water and chill in the refrigerator. Ice cubes can be added to speed up the chilling process. For best results, allow the water to steep for at least one hour and stir gently before serving. The same cucumber (and lemon) can be used for multiple batches of cucumber water. Simply leave the slices in the pitcher and add more water. 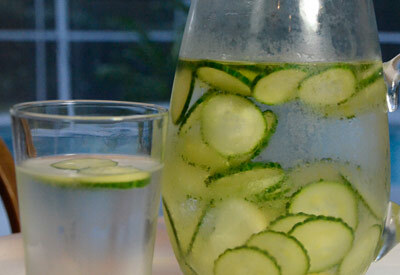 Consume the cucumber water within two days as the beverage will become less flavorful. Instead of discarding the cucumber slices they can be consumed as a light snack!